Dans Tes Bras is a perfume by Editions de Parfums Frédéric Malle for women and was released in 2008. The scent is floral-spicy. It is being marketed by Estēe Lauder Companies. Editions de Parfums Frédéric Malle launched in 2000 with a rock-star lineup of perfumers, including Maurice Roucel, who composed the culty Musc Ravageur for the brand. Art direction and commissioning independent perfumers was nothing new in 2000. In fact, it was the founding model of niche perfumery. Early examples Diptyques (1961), l’Artisan Parfumeurs (1976), Maitre Parfumeur et Gantier (1988) were still going strong. The Serge Lutens brand (1992) had attained permanent revolution and were the leader in experimentation. Hip and trendy were taken, so Frédéric Malle took a different approach with his line. The strategy of the initial roster of FM perfumes was to emphasize quality and distinction. Perfumers were apparently given the edict and the budget to create perfumes of impeccable caliber and taste. Same principle as Amouage, different sensibility. The nine perfumes in the initial launch wore their perfumers on the label, reflecting Malle’s belief in the artist as well as his line’s concept of authorship and publishing. The art direction focussed on the perfumers’ signature styles. Olivia Giacobetti’s En Passant had her characteristic water-color dynamics. Angelique Sous la Pluie demonstrated Jean-Claude Ellena’s expertise with transparent tones. Edouard Flechier’s Lys Méditerranée fits his history of oversized narcotic florals. And so on. Malle and Roucel were an ideal pair. Malle directed perfumers to work within their sweet spots and Roucel had a history of exploring a compositional motif over the course of years. Musc Ravageur was a tailored version of Alain Delon Lyra, a Roucel fragrance from 1996. Roucel would go on to create le Labo Labdanum 18, Helmut Lang EDP/EDC and Missoni by Missoni, variations on the same aromatic/musk/vanilla-chocolate theme. Roucel and Malle collaborated again with Dans Tes Bras. Roucel had made violet the principle note of his hairspray-fantasy, Guerlain Insolence in 2006. He punched up the violet and the volume in the 2008 Insolence EDP. Dans Tes Bras, a violet perfume of a very different cut, was released the same year. If Insolence candied violet, Dans tes Bras fermented it. If you can imagine scent-scape of violets and toadstools growing out of vinegar-soaked concrete you’ll catch the shape of the perfume. It’s a doughy floral musk with notes of soil, salt, spice and sour skin. Our nose/brains are conditioned to try to sort scents. Materials that emulate botanicals are assessed for how ‘natural’ they smell while identifiably synthetic qualities aren’t expected to feign realism. Dans tes Bras flips the expected and uses floral notes like heliotrope and violet that smell for lack of a better word, unnatural. With an apparent overdose of cashmeran, the synthetic side of the perfume smells remarkably like something you know, namely concrete sidewalk drying after a rain . Most Malle perfumes land in identifiable categories, the result of deliberately chasing the ‘best in class’ distinction that the Malle line aspires to. The risk is that many of the line’s perfumes can be seen as simply extra-fine versions of department store perfumes. Dans tes Bras, not so much. In a line that leans heavily towards florals it is the least conventional of the lot. The Malle line seemed like it was headed for a soft landing even before Estée Lauder purchased the brand in 2014. Eau de Magnolia, Cologne Indelible and Monsieur were a citric floral-chypre, a concentrated eau de cologne and a Soli-patch. Finished and tony but a bit dull. I assume that each perfume in the Malle line will be looked at very closely by the Lauder accountants. If there is a thinning of the line, florals in particular, will Dans tes Bras make the cut? 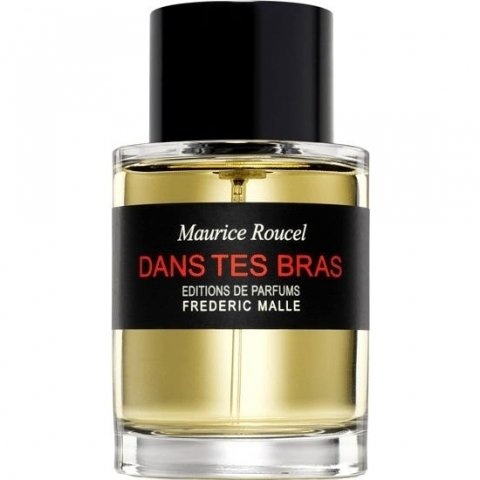 Well, despite I really, deeply dislike this brand, its approach to perfumery and its utter pretentiousness, I must admit Dans tes Bras is probably one of the nicest offerings by Malle (that says it all). Still dull for its price range and with a quite mediocre evolution, but well, there’s worse than this. It opens as a laid-back, cozy, simple yet quite refined and clean – a soapy, warm, talc and soothing kind of “clean” - powdery scent which blends a sparkling bergamot head accord, a rich, pastel lavender-violet-heliotrope heart and a smooth, warm musky-vanillic base enriched by Oriental notes of (I think) tonka and soft woods – for once, I clearly get a decent sandalwood reconstruction, with its proper “milky soapiness”, refreshed by an edgy note of cedar. All tinged with a very pleasant and subtle whiff of earthiness, avoiding any plushy-sweetish gourmand effect often associated to this type of compositions. On the contrary, Dans tes Bras feels initially very airy and actually quite simple too, with no traces of the “complex sumptuosity” that you often find in this type of Oriental powdery scents. Synthetic as hell, but well played. So, a classy and affable Oriental cloud of talc at first, with powdery-floral-woody notes a bit in the vein of Villoresi Teint de Neige, or Boucheron Jaipur, with quite some differences though: smoother, cleaner, way simpler, much fresher, less sweet and completely “un-spicy”, more focused on gentle notes of violet and heliotrope paired with crisp woods and pine-infused balsamic notes of lavender. I really appreciate the initial herbal-balsamic vein which brings in a touch of “fresh air” and makes Dans tes Bras smell like a weightless, almost “healing” interpretation of a classic powdery Oriental floral scent. It feels extremely soapy and comforting to wear, and it performs quite well, with a transition towards a drier, earthier... and sadly, so much more mediocre drydown, which just like a beautifully painted Barocque trompe l’oeil concealing your crappy toilet, reveals the “hidden nature” of this fragrance: a flat, extremely synthetic base of “white flowers”, musky violet and generic “soft woods”. Not abysmal, but it’s always disappointing to see some “magic” vanish away so soon, especially if you’ve just spent a hell lot of money for it. I wonder if niche brands work with marketing agencies providing them with reports calculating the average time a customer needs to try a scent, complete the decision process and pay for it, and compose their scents accordingly. The transition is truly sudden here – from an almost-very-good fragrance to a cheap fabric softener. Nonetheless, despite the disappointing evolution, I don’t feel bashing this scent. Or well, just a tiny bit. Even if it smells more and more cheap as minutes pass, it still keeps a pleasant presence on skin. So overall I would surely consider this not full bottle worthy at that price, not even half of it, but if you get it as a gift and you inexplicably resist to the temptation of making some good money out of it, I guess it can be nice to spray this for a sunny morning out for grocery shopping – completely pointless, but I guess it’s the kind of nonsense bourgeois “shabby chic” acts many Malle’s customers love. With this fragrance, Frédéric Malle brought back Maurice Roucel (creator of Musc Ravageur) to make a scent which captured the smell of warm skin... salty, warm and sensual. To do this, Roucel used a lot of Cashmeran®, a synthetic compound which smells like soft wood, sweet almonds, warm spices and light musk. What you get is a very intimate creation (entirely synthetic), but very sensual. It works on two levels I think. One as a powdery, purple floral type (violet flowers, heliotrope, hints of jasmine), the other as a darker woody, musky, almost mineral-like fragrance (with Cashmeran®, White Musk, Incense, Patchoulli and Pine needles). I think the combination of these two levels (sweet & powdery vs dark, earthy & woody) is what confuses people when experiencing it. To my nose this comes across mainly as a sweet, musky, earthy, violet & heliotrope type of perfume. It basically has a warm, musky powdery vibe which could work on either a man or a woman. I would say this reminds me a lot of a cashmere sweater, worn in winter by the fire. I see this as a perfect cold weather fragrance. Also, like many of Frédéric Malle perfumes, a little goes a long way. This would certainly last for a very long time if sprayed on a scarf or a sweater or any other material... and I think it would definitely compliment autumn and winter clothing very well. I'll be honest, Dans Tes Bras is not a perfume to be fully understood at first sniff. It took me a long time to understand and warm up to it. This is why I call it an "intellectual" perfume, because once you realise how cleverly this is made, you really start to appreciate it even more. Nearly all the notes are synthetic, but they are very expensive and the perfume as a whole is extremely well made, but can be complex to a lot of people who don't have too much experience with a wide variety of perfumes. Synthetic notes, when used in the hands of a master perfumer like Maurice Roucel or Jean-Claude Ellena can influence incredible perfumes and make them works of art. Therefore there is no shame in buying a perfume that has a high concentration of synthetic notes (like in Dans Tes Bras) but especially when used so cleverly and inventively by the perfumer as to give you something really amazing to wear. Even though I refer to Dans Tes Bras as an "intellectual" type of fragrance, I don't think you really need to have an incredibly advanced range of smell to appreciate this one. I think most people would see this as a sweet, musky, powdery scent (which is warm and sensual and expensive smelling). Another group of people may find it too dark and earthy and "weird" if they are not used to it. From my own experience, I've found that you actually need to give this one time on your skin, and a few wearings in the right amounts, that's when you can really start to appreciate it... and if you research how cleverly this has been created, you will perhaps understand and maybe appreciate it even more. Get a small sample, wear it sparingly over a few days in the right weather, and see if you like it. Upon wearing this, you may get the impression of being in a deep, warm hug with someone you love. After all... it's name, Dans Tes Bras means In Your Arms. Maybe not one of my favorites in the strong Malle lineup, but I at least "like" Dans Tes Bras. It opens with an extremely brief bergamot and jasmine mix, while quickly transitioning to a somewhat synthetic woody incense mix that primarily is composed of a sharp cedar note similar to the one used in Bois D'Orage, but maybe a bit sharper. The heart also has violet in it (even though it is listed as a top note on this page) but the woody accord stays up-front. The dry-down mixes the remnants of the wood, mixing with musk. Longevity and projection are above average. Dans Tes Bras is a bit much for me, and it also is too synthetic for my personal taste, but I find it pleasant enough and definitely wearable (and no, I don't get the mushroom association as others have for what its worth). Not my favorite Malle, but not my least favorite in the line either. I would say on the whole its a success, just not a major one and not necessarily worth a purchase at its relatively lofty price tag. 3 stars out of 5. Write the first Review for Dans Tes Bras!